If you need to buy an awning for your recreational vehicle, which can help shelter you and your family from both the sun and inclement weather, you can either purchase one from a shop that sells RV supplies or buy direct from an RV awning manufacturer. The advantage of purchasing direct is you may be able to save on some of the overhead costs. However, if you buy from an RV supply shop that sells several different brands it is easier to compare them side by side. The first step to picking an awning manufacturer is deciding which type of awning you would like. Each company offers something a little bit different. Here is a basic overview of some of the leading brands. Eclipse specializes in power awnings, which you extend and retract with just the push of a button. A motor powers the rollers to collect the fabric at the same time that a rafter arm pulls it tightly against the side of your RV. These awnings can be battery powered or hardwired. 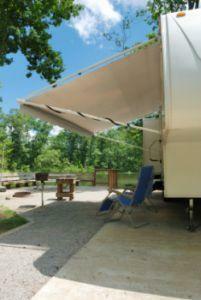 Mirage is known for its large lateral arm awnings that reach up to 10 feet out from the roof of the RV. It makes both power awnings and crank models. The power awnings retract automatically in high winds to prevent them from snapping off. Spirit FX makes the Cadillac of RV awnings. Its awnings have built-in lights, tie downs and hangers to make for a posh outdoor setting. You can lock the awning in place in less than a minute. The fabric slides out on a track to reduce the risk of snags. Simplicity Plus is on the other end of the spectrum with more budget-oriented models. These vinyl awnings have lightweight aluminum rails. They quickly snap and lock into place and adjust with the push of a button; no handle movement required. A good place to find additional awning types and manufacturers to further supplement your research is RVAwningsOnline. This site has sections devoted to patio awnings that can create a sort of porch area, window awnings that cover window openings to keep out the rain and slideouts that come straight out from the side of the RV anywhere you wish. The site also has detailed information about fabric choices and other awning features you will have to take into consideration. The price of an RV awning can vary greatly, depending not just on the RV awning manufacturer but also on whether it is manual or automatic and if it's made of cloth, vinyl or another material. It can set you back anywhere from a couple hundred dollars to several thousand, not to mention the installation materials and any separate locks or other aftermarket options. Once you buy your RV awning, the next thing you have to think about is how you are going to install it. While it is possible to attach it yourself, it can be difficult to do and there is a high risk of breakage if it is not installed right. The awning itself can break, as well as the walls of your RV, if the support system is not properly in place.Oftentimes, the shop where you buy your awning will offer installation services, sometimes as a package deal with your awning purchase. It's a good idea to ask when you buy instead of shelving the awning in the closet and then worrying about getting it installed later. If not, you may have to contact the RV awning manufacturer you choose to go with and get detailed instructions. Give yourself ample time to do the installation so you will do it the right way the first time.